The previous tutorials explained how to delete an email in Gmail, and how to delete multiple emails at the same time; in this tutorial, we will show you how to recover emails you have deleted, as long as they have been deleted less than 30 days earlier. 30 days is the amount of time Gmail will keep deleted messages inside the Trash folder, before permanently getting rid of them. We will show you how to restore a few selected emails from the Trash, or how to undelete the entire content of the Gmail Trash. If needed, first sign in to your Gmail account. 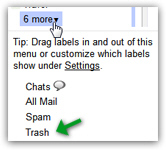 Once you are in your inbox, look at the left pane that contains folders and labels: if you see "Trash", click on it. Then, click on the "Trash" menu item. Gmail will bring you inside the Trash, which looks and behaves much like your inbox: you will see listed all emails you have deleted within the past 30 days. Finally, click on the "Move to" dropdown menu, and choose your Gmail inbox (or another label of your choice). And this is how you restore deleted emails from the Trash in your Gmail account!